The stencils below were produced to make the drawing of lighting plans easier for designers. They also attempted to use standard shapes for the different models of lanterns from different designers. Of course, each lighting plan would use a variety of different lanterns. For a touring show, a generic symbol (for, e.g. 1kW Fresnel) was used. Whereas for a show made for a specific venue (with a known equipment list), the symbols could be more specific (e.g. Harmony Fresnel, Patt. 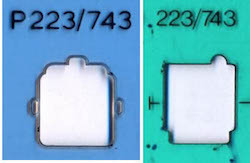 743 and CCT Starlette Fresnel could all have slightly different shapes). The safest option is to use a key on each plan, showing clearly which symbol refers to which model of lantern, as different stencil manufacturers use different variations of symbols to refer to the same equipment. See the Theatre Projects stencil exhibit at the bottom of this page to find out about the history of the stencils used in the UK.